Need to lose weight or maintain your weight loss? 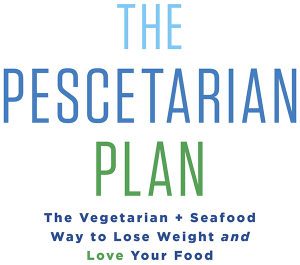 Here’s how to stay within a daily calorie level on The Pescetarian Plan. And, of course, you can also try the calorie controlled meals starting on page 285 of the book. There are lots and lots of great meals, many based on recipes from the book. * The number in the parentheses indicates the number of servings that should consist of nuts. If you’re allergic to nuts but not to seeds, then eat seeds instead. If you’re allergic to all nuts and seeds, then skip them and eat the other healthy fats listed in chapter 5. ** On the 1,500-calorie plan, have a 100-calorie treat every other day. † You can drink other beverages on this plan in the “Smart Sips” section in chapter 5. Here’s a rough guide. You’ll find serving sizes for more foods and specifics information on those serving sizes, such as how many fatty fish servings to eat per week, in chapter 5. I included treats on this chart just to remind you that you do get them! But because portion sizes vary so much, you must track calories for just this one food group. Type of Food A serving looks like . . .